There is no doubt that XRP cryptocurrency has the most active and large community in the crypto space. Often this community is known as XRP Army who doesn’t just cheers for the project but boosts the adoption of it. Allow us to buy SkypeCredits with XRP TipBoat, allow us to send micros payments on Skype chat as well. Like any other leading technology company Microsoft is already testing blockchain. Furthermore, XRP enthusiasts keep on inviting the large members from the community to vote on Skype and as such, a Twitter user (Paris by David, seems like the same person suggested an idea on Skype) took to Twitter and said ‘let’s make it happen’. 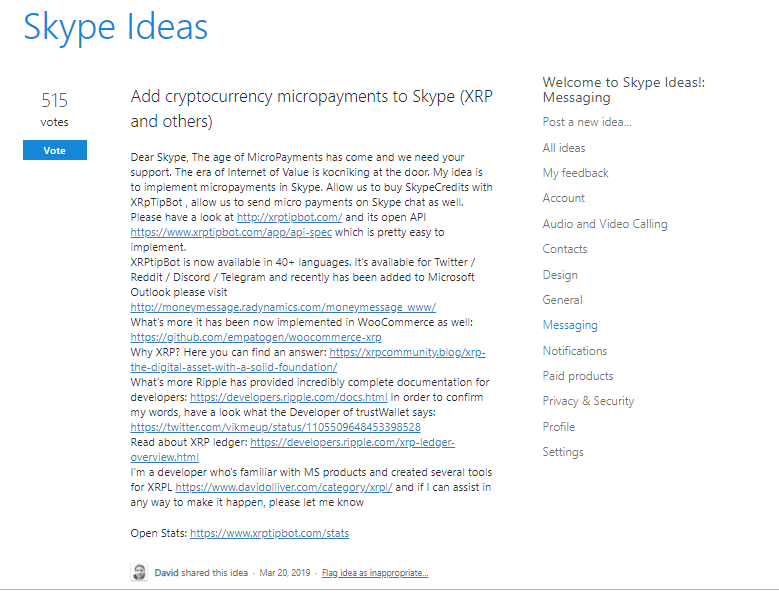 The post XRP Community Demands Skype to Implement XRP Micro-payments Via XRP TipBoat appeared first on Latest Ripple (XRP) News & Price Analysis.